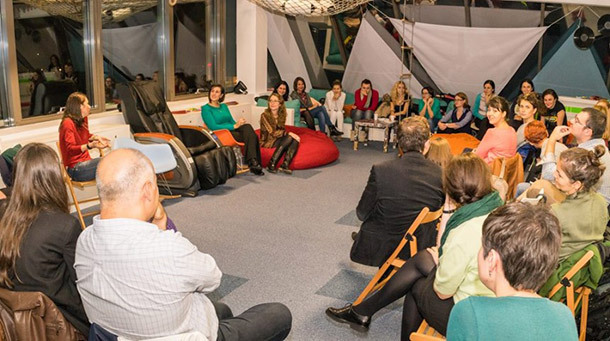 Last week we met the Young HR Pros community at the Zitec HQ, for a sharing evening about our work space. How the event went, what we talked about and what they liked most, you’ll find out in the guest post below. “ It’s easy for us to give examples of cool work environments, but we assure you it’s harder to find a definition or to put together a list of steps to follow that can help us transform the work environment of the companies we work for, into ones that could make us be more engaged. As we’re being influenced by the growth of the IT&C industry, we’re starting to pay more and more attention to this concept that, not that long ago, wasn’t a must have, but a differentiator. Nowadays, the standard is to have a cool office space with all kinds of other benefits. As you read this article, please keep in mind that the work environment it’s not only about the space, but also the sum of activities which can make the employee experience, a positive one. Since we wanted to find out what makes a work environment cool, we challenged the Zitec team to a sharing evening on this theme. They accepted our invite, so, on a Tuesday evening, on 20th of October, we gathered in their cozy relaxing area, to find out their perspective. Florentina (HRD Zitec) started by telling us that, at the foundation of the entire Zitec concept stays the belief that it’s important to do what you want to do, and have fun while you’re doing it, and that the work environment can strongly influence how we do our work. Having a management team who is really open to new ideas, inspired the team to communicate better, to come with proposals, to show their creativity, things that are also inked into Zitec’s organizational culture and in the way their office space is decorated. It is really important for them that every new colleague feels part of the team, and resonates with what he/she does, so the girls of HR team constantly involve their colleagues in the activities they organize. And speaking of events, as you probably know, Zitec has lots of them: teambuildings, team evenings, technical or non-technical workshops and trainings, an annual Hackathon called ZiHack, they even have their own band called ZiBand. And if these activities are not what they’re looking for, they can always group based on their common interests and organize anything else by themselves. All these stories Florentina told us, made us imagine how it would be to be part of Zitec’s team and to ask ourselves how we could bring this model, or at least parts of it, within our companies. We came to the conclusion that, in order to do this, we need business support and that we can obtain it by starting with a proof of concept – a relaxation room or something similar, so we can show the management that our colleagues actually need this kind of office space. In what measure is the work environment influencing the employee retention? Of all the existent benefits, which will be really important and part of the core benefits package five years from now? How can we deal with the generation gap when you take into consideration redecorating the office, especially in the non-IT sector?